What happened – Indian Election 2014? If there is one word that best describes the results of the 2014 Indian Parliamentary Elections, it is SURPRISE. For some it was a very pleasant surprise – for others it was a nasty shock. But nobody including the paid analysts had really any clue how close they were to the truth when they were predicting a landslide victory to the BJP. Congratulations to the BJP for running a brilliant campaign and being able to influence the mind of the voter. Narendra Modi was decisive, communicated incessantly, used the media with aplomb, took every advantage that came his way including the six week staggered voting mechanism, capitalized on a cadre of dedicated people who did him proud and stuck exclusively to a development agenda which resonated with the common man. The fact that the BJP was voted out of power after Gujarat 2002 was not ignored. This time around, the BJP stayed clear of the RSS inspired Hindutva agenda and leveraged the good governance in the States where they had the government to promise the same in the country. The hard work and complete dedication of the RSS/BJP cadre can only be admired and applauded. Modi didn’t exaggerate when he said that it was because of them that he won the election. That is a fact they can be proud of. Congratulations also to the Congress for being so spectacularly blind to the writing on the wall, even though it was in the form of an electronic, neon lit bill board in pulsating psychedelic lights, predicting its demise. An epitaph must necessarily be brief. Congratulations to the Muslims for being divided so fragmentally that for the first time in our post-independence history the famous ‘Muslim vote’ that everyone respected and feared was rendered completely ineffective. UP with all the major Madaaris and Aligarh Muslim University and some districts with over 40% Muslim voters . If that doesn’t show that Muslims voted for the BJP then what else does it show? Hubris: Congress was living in a world of make-believe living off a legacy that had really dried up at least a decade earlier but even the final wet mud at the bottom of the pool went dry now. Failure of dynasty politics – one hopes it has truly failed and will not merely be replaced by another dynasty – in a nation that is more used to kings and dynasties than to democracy is something to be pleased about in itself. Next step, hopefully, will be leadership based on ethical and moral principles and not on caste – but maybe I am stretching it. BJP: Ran a campaign completely devoid of the Hindutva agenda of its previous incarnation. It spoke of good governance, justice, economic empowerment and inclusiveness. So one must ask if this is what got them the votes – and not the RSS inspired Hindutva mandir/anti-Muslim agenda. After all the fact that the BJP won 73 out of 80 seats in UP shows that Muslims voted for them – which in itself was totally unexpected – until one considers the spectacular failure of Mulayam Singh’s Samajwadi Party, elephantine megalomania of Mayawati’s BSP and the sleepwalking of Congress. Then what was unexpected becomes logical. We can only forget or ignore the power of culture and history at our own peril. We are a nation that has a 5000-year history of kings and just 65 years of democracy. In that 5000-year history, we never rebelled against a king. We worship strength and power. We see kindness and compassion as weakness. Greatness is defined in our culture as the ability to break the law with impunity. This ‘greatness’ extends to a ‘great man’s’ servants and followers and so to be associated with a ‘great man’ is seen as a personal advantage. A ‘great man’ in our culture is one who can protect those who do his bidding regardless of right or wrong. Modi projected himself as that ‘great man’ – the electorate proved that he was accepted in this role. Today, we consider corruption merely as cost of doing business to be factored into our rates and costs and justified by the benefits that accrue. 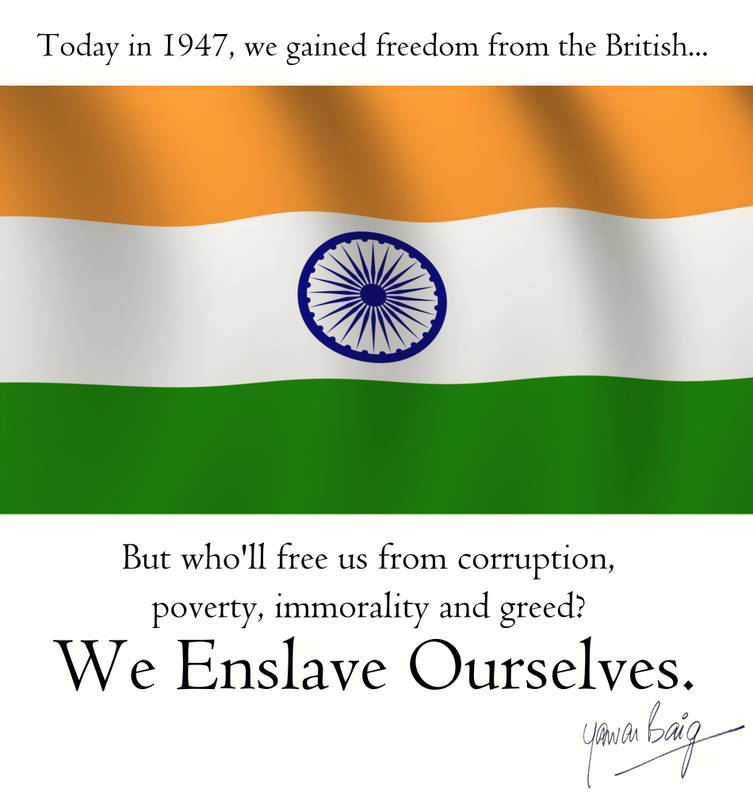 Corruption is now in our blood and has changed from being an aberration to an aspiration. There is no stigma attached to it at any level. It is merely seen as payment for service. It is only when we pay and don’t get the service that we complain – which is what happened in the Congress government. Equality, egalitarianism, social causes, ideology and even justice is seen by most Indians as interesting at best – but not something we are willing to invest in or will commit to live by. The demise of the Trade Unions and the Communist Party and the decimation of the BSP (Dalit Party) in UP are cases in point. We are a selfish people – we look for personal benefit above all else. Modi promised us personal benefit and we believed him. It remains to be seen what he is able to deliver – but the Sensex reflects this public optimism. Divisions: 2014 was a year characterized by one spectacular meteor flying across the political horizon – clad in a funny cap and a muffler round his neck, broom in hand – Arvind Kejriwal – who like a meteor seems to have crashed in flames. However, while he was in flight, he emanated the light of hope – the hope of clean government, power to the common man, nemesis of the big business-brigands who populate our corridors of power and an end to our crippling corruption. He upset everyone’s calculations in Delhi elections; he trounced Congress and rendered Sheila Dixit homeless and then didn’t occupy the house to which he was entitled, thereby presenting Manmohan Singh with his own retirement home. Many voted for him or really for what he stood for. But not enough to save him or his own seat. Imagination not converted into a ballot box victory. Good case in point about the power of decisiveness and the failure of philosophy. We are very pragmatic people who like definite things. Arvind Kejriwal miscalculated and didn’t realize that philosophy doesn’t sell. Neither does being slapped in public – it may get you pity – but it doesn’t get you respect. Calling it ‘Gandhian’ is incorrect because Gandhiji was never slapped by any Indian and in any case he never had to win any election. We Indians want a powerful decisive leader – not one who can’t even protect himself from being slapped. Costly miscalculation for Kejriwal. Sad for all who supported him. Using UP as a good example of what happened across the country – on one side was the committed BJP voter who would come out in 42°C temperatures to cast his vote for his party. On the other side was the Congress/Secular party voter who had to choose between BSP, Samajwadi, AAP, Congress and many smaller parties – and he did – all to the benefit of the BJP. So in a manner of speaking the BJP is beholden to all those who voted for Congress, BSP, Samajwadi, AAP and others for its spectacular victory. It shows also that the single minded interest of the voter is an economic agenda in pursuit of which he is able to forgive and forget everything else. No matter how unsavory and unidealistic this sounds, this appears to be the reality of the Indian voter across all divides. Another contributing factor is the quality of the Muslim leader – Mukhtar Ansari is a case in point – who is so completely pathetic and uninspiring that it is little wonder that they chose Modi over him. So would you and I. The Ulama, engrossed as they have been in their internal conflicts for the past several years, completely unconnected with their constituents, were rendered completely ineffective, including those who entered politics – after all if you join the party of (Mukhtar Ansari), a convicted criminal, what else do you expect than to be ignored – and good riddance. Walking the talk is essential. If you talk unity and walk dispute it costs. Wonder if our Ulama will learn the lesson. Now that this has happened and we all seem to be in a state of shock – the big question is what must we Muslims do? In my view, we need to do the following which will be difficult and bitter but then the alternative is even more bitter to contemplate. I hope we are able to see the reality of what we face and have the guts to do what we need to do if we really want to ensure a secure future for generations yet unborn. Do we have it in us to act? History will bear witness. Winners are not those who don’t fall. Winners are those who get up the quickest. Not just get up – because everyone eventually gets up – but get up fast. The first and foremost thing to do is to remind ourselves and others that we Muslims are citizens of India – with one cardinal difference – our fathers chose to live here when they had the option to go to Pakistan. Others who live here had no option. We did and we chose to live in India. India is our country. We don’t need anyone’s permission to live here and neither do we need to prove our loyalty to anyone. India is our country – we live in it and for it and we will die in it and for it. Patriotism is loyalty to our nation, not loyalty to any political party. We are patriotic and nobody has the right to question our patriotism and we don’t have to defend it or to answer anyone who is ignorant enough to question it. This is our land, the Constitution of which guarantees us the same rights as every other citizen, irrespective of caste, creed or religion. This is our land in which we are equal to every other citizen of every other caste, creed or religion. We stand for India and against anyone who is an enemy of our country. This is my land – our land – the land of our forefathers and the land of our generations unborn, yet to come. It is from this mindset that we must proceed. We have lived in this land from times immemorial. Muslims have been in India for the past 1389 years, beginning from 625 AD (4 Hijri) when the first Arabs came to Kerala and locals accepted Islam. What ancient Muslim rulers did during their rule – both the good and bad – is not our responsibility; we weren’t alive then. Neither is what happens or doesn’t happen in Pakistan, Saudi Arabia or any other so-called Muslim country. What is relevant is our own history where we the Muslim people were at the forefront of the Independence movement where our leaders fought alongside their compatriots and were imprisoned and killed by the British Colonial power. In modern India, our Madrassa system educates more than 2 million children free of cost, which costs the community Rs.12 billion per annum. There is no other community in India who spends this kind of money on educating its people, which is really the responsibility of the Government of India as we are Indian citizens. We are Indians and India is our concern. This is our reality and it does not change whoever comes to power. For anyone who is interested in the welfare of this nation I must say that Indian Muslims are 20% of the population – it can be a force to reckon with in respect to buying power, economic drive and stability, if it is harnessed by investment in its development, or a drag threatening to drown the nation if it is discriminated against, oppressed and driven to the wall. I don’t see anyone with any intelligence wanting to make enemies of 200 million of its own citizens. That would be suicidal. In that case this portends good for the Muslims who can look forward to development programs and real upliftment from poverty and deprivation. For the nation it can only mean great benefit because economically empowering 200 million people is to empower the whole nation. We need to give the BJP the benefit of the doubt and take them at their word and wait to see if they live up to it. Logically they should because they are certainly intelligent people. The future will tell. The BJP brings out its earlier RSS inspired agenda of oppressing Muslims and using them as a scapegoat and allows our brigand-businesses to have the field and make hay and more while the saffron sun shines. I don’t think I need to describe that scenario. Its results can only be imagined. The reality will be worse. In that case what will be, will be. Living in terror expecting the worst makes no sense. Living with hope, does. Irrespective of what future unfolds, it is up to us to decide what we must do. Here’s what I believe we must do. Be resilient. Get up from the floor. Accept reality and take stock. The thing that distinguishes nations that endure is not bravery or strength but resilience. The ability to simply stay in the race, no matter how many or how bad the knocks. What are the brutal facts with respect to the political history of Muslims in post-independence India? In one word – deteriorating quality of leadership. We have been on a slide and the end is not in sight yet. No vision, strategy, unity or discipline. Just bravado, loud mouthed speeches. Our leaders are true to type with the kind of mercenary, corrupt leadership that we have been plagued with in India. Our leaders are as corrupt and mercenary as anyone else with absolutely nothing to distinguish them as Muslims. Islam is not a differentiator except as a convenient tool for them to whip up emotions to serve their own short sighted political agendas. Our leaders are politicians in the worst sense of the term and not the statesmen that we need. Congress, in one form or another, ruled this country since independence except for one term when the BJP (NDA) occupied the throne in Delhi. In that long period of over 5 decades, every atrocity that was done to Muslims, from the demolishing of the Babari Masjid, to the so-called Bombay pogrom, Bhagalpur pogrom, Makkah Masjid blasts, the latest pogrom in Muzzafernagar and a million others, as well as the gross neglect of and discrimination against Muslims, all happened under Congress rule at the Center. The BJP not to be left behind allowed the Gujarat pogrom to take place during their watch. Then came 10 years of Congress rule during which the plight of the living was a reflection of the savagery that marked the death of their families. Nobody was brought to justice. The Congress did nothing to right the wrongs of the BJP, much less its own. One common feature of all these tragedies is that the Administration aids and abets the crime and no criminal is ever brought to book when the victim is a Muslim. There is no difference between the Congress and BJP in this respect, except that the Congress was in power for much longer. As a community, we’re a people who spend a thousand times more on ostentatious weddings than on poverty eradication of our own people. We’re steeped in Shirk and openly disobey and challenge the orders of Allah. We forget and ignore that the decisions of Allah are based on our actions. We forget that results need investment. We forget that good luck comes to those who are prepared – it is the name for what happens when aspiration meets preparation. We are selfish and concerned only about ourselves – ask when was the last time you saw Muslims agitating because a Dalit was murdered? Ask what we did when Christian priests and nuns were murdered and churches burnt in Orissa. We moan only about our own and watch silently when it happens to others. We follow leaders who have never even seen a global platform and wouldn’t recognize it if it punched them in the eye and have no clue what to do if they’re given access. Yet we, the followers, don’t have the intelligence to see this or to recognize how suicidal it is to follow such leaders who at best are an embarrassment and a clear symptom of the fatal malaise that we are plagued with – congenital blindness. If one makes a mistake once, it is an opportunity to learn. If he makes the same mistake twice, it’s a sign of stupidity. We have made this mistake multiple times. Our current situation, documented in the Sachar Committee Report, is the result of a complete failure of our leadership at every level. That we have done nothing significant to change that situation, 8 years since the report was published (30 November 2006) apart from carping, is a mark of the fact that we are lethargic, looking for saviors and ripe for the taking as victims of anyone who wants to use us. We have been used and discarded many times, yet we learn nothing. We’re in this mess because of our leaders not despite them. Our leadership is self-serving, corrupt, blind and deaf, concerned more about interpersonal conflicts than about the welfare of the community. Our leaders – sadly religious leaders included – are at each other’s throats publicly, plunging the common man into confusion about who to follow. We need leaders with vision and strategy and followers who’re willing to put aside differences and unite and work with discipline to achieve the goal of uplifting the community. We’re people who can’t see the need to invest in developing leaders yet we complain that we don’t have good leaders. Leaders don’t grow on trees even in 10 Janpath. Until we learn to put our money, time and energy where it counts, we will continue to suffer. So until we get the leaders we need it’s better to batten down the hatches and ride out the storm. Following such people will only lead to more grief. Test: Name one Muslim leader who you’d love to apprentice your son to, so that he may become like him. Yet we must never lose hope. Not only because it is Allahﷻ who we worship and on Whom we rely, but also because those who lose hope perish. For all our faults we have been around for 13 centuries while the BJP government will be around for 5 years. So we must work with hope and with great dedication to improve our situation. Waiting for Avatars to save us is not from our theology. We are a nation which believes in the power of self-help. Let us show it to the world. The time is now. The world has changed. Our leadership has failed spectacularly. Solutions to our problems are not with those who are the cause of those problems. What we must do is . Then we must plan investment for the scenarios we choose to focus on. We live in a connected world and we must learn to use those connections. Simply updating FB statuses doesn’t help. We must learn to harness the power of technology to tell the world our story. We need to create Media Watch groups who will monitor what is reported about Muslims and Muslim issues and can counter propaganda effectively. We need to train people in this. We must realize that we need to create a whole new generation to do all this. Our traditional leaders are a part of the problem. Expecting them to give us solutions is unrealistic. If they had solutions we wouldn’t be in this mess. I know I am going to be called ‘disrespectful,’ but someone must tell the emperor that he is naked. Money talks. More money talks more. This election proved the power of money. So we must decide to invest in ourselves – in long term projects to develop global Muslim leaders. We need to put our money where our mouth is. It is a tragedy that in a population of 200 million there is not a single Muslim leader who can represent the case of Indian Muslims at the United Nations, for example. I am not saying that we need to do it today. Just that if we needed to, we have nobody who can do it. Unpleasant as it is, we must recognize this and do something to change this situation. Leaders are not born overnight. Leadership development takes time and resources invested consistently with dedication. We must also consciously stand up against divisive leaders. We have spawned too many of those. We need to reject them and support those who speak the language of inclusion. That we have leaders who thought that polarizing the vote was a viable strategy . We need to keep hearts together and take people along if we want to build unity. And unity is what we need above all else. Unity can’t be defined as, ‘Let us unite – everyone please agree with me.’ Unity must be built by accepting diversity of views and practices. By respecting difference and the right of the other to differ. We need to do this across religions but let us begin with our own people. Sadly, we are most divided amongst ourselves. We must invest in a and that our Constitutional Rights are not frittered away. The Legal Cell must also pursue justice in all cases where Muslims have been harmed. We support the rule of law but that has to be claimed and pursued for it doesn’t always happen automatically as we have learnt all too often to our cost. We must support the education of our youth in the areas of journalism, law and politics to create a cadre of capable workers. We must claim our rights and realize that you never get what you deserve. You get what you can negotiate. Finally, we must decide to work for the long haul. Our current situation of confusion and weakness didn’t happen overnight. Its solution will also take time to show results. We must work for the benefit of the community and the nation – not for the seductive glory of flash bulbs. Those who can’t work quietly and steadily and who seek publicity must be rejected. They demonstrate childish immaturity that we can ill afford. We need to work with faith and perseverance. For in the end the race goes to the one who stayed in it long enough. “Begging” is used in the old, antiquated sense to mean “lacking”. Did you ever hear the expression that something “beggars the imagination”? Same sense, same root. It means you lack enough imagination to even conceive of whatever preposterous thing you have been confronted with. A lucid commentary on the sorry state of affairs we find ourselves in.But will we ever learn? Selfish self aggrandizing leaders who will continue to mislead us must be ignored. I think this is the best analysis of the present times particularity in relationship with Muslims and their prevailing conditions.But it is the time the whole community has to rise and show that they are not push overs and can really perform. I was looking for something like this. Did not know how to make sense of all that is going on, but this gave me some perspective, Alhamdulillah.